The Australian Small Business Blog: Does Your business suffer from Growing Pains? Busier than a one armed wallpaper hanger? Don’t have time to scratch yourself? Have a waiting list for new clients? Has previous exponential growth rate has slowed to a crawl? If so, then it’s likely your business is experiencing growing pains. Chances are you are working longer hours than any of your staff, and are the last to get paid. Your business is a victim of its own success. If you do take any time off, when your return, you wish you had never left. It’s as if nothing happened at all when you were absent. Sure, work was done, but nothing progressed, and your inbox is full of unanswered enquiries. Your business has become its own version of groundhog’s day. While it feels like a trap, it’s also an opportunity. Like a teenage boy growing out of his clothes ever half year, your business has outgrown its strategy and systems. What worked in the past no longer fits, and you need a whole new wardrobe. The opportunity arises when you diagnose this situation, and recognise that it’s unsustainable, and you decide to take action. Here are the Five R’s that will allow your business to overcome the growing pains. While your business depends so much on you, there is no time to step back and review it, let alone to take action to change it, so creating time is the first priority. This can be done through outsourcing, delegation and re-organisation. This will require putting in place simple systems that will allow you to pass work onto others to create the space you need. When you stop spending dollar time on penny jobs, you will have the space to take the next step. Investigate where your business really makes its money. There are often pockets of gold hidden amongst the cross subsidies to other parts of your business. Which products and services and which customers make the biggest contribution to your bottom line? Where are you and your staff spending most of your time? It in your gold mine. In light of your review, which products, services and customers will you be focusing on? How will this affect the way you promote your business? Will you change the way you deliver your products and services? This enables you to get the biggest bang for your buck, which is essential in small business where the bucks are fairly limited. Once you have re-engineered your business, you will need to redefine roles in your organisation, complete with business systems, job descriptions and performance standards. Your staff will now be in a position to manage your business when you are away. This final step allows you to manage your business by reports. This is the system that drives all the other system in your business, and gives you the confidence to delegate. Ultimately, gives you a business that will run without you and turns it into a Saleable Asset. 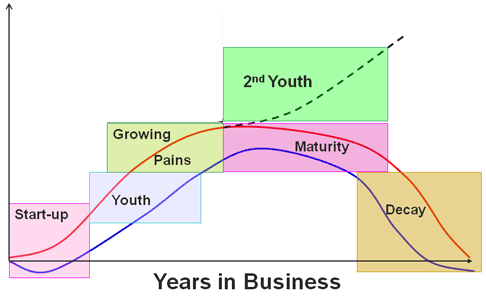 Share this article: Does Your business suffer from Growing Pains?